At the CGA restaurant event – London, UK. 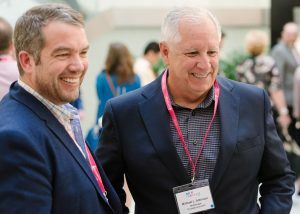 Pete Craig (l) and CEO Michael Atkinson (r), April 19, 2018. We are passionate about what we do here at Orderscape. This means we get to share our enthusiasm and knowledge with retail merchants, restaurateurs and service providers everywhere. In exchange, we receive insight into what consumer use cases are on top of their minds. For the past several months, I have been speaking and evangelizing the power of voice technology at restaurant technology events in Austin, Dallas, Washington D.C., Orlando, Los Angeles and London. Every time, operators and information technologists are wowed by the possibilities. And, frankly surprised that voice ordering and voice as a service is being used now by both merchants and consumers. Voice is here and growing in use. The adoption numbers are staggering. Capgemini research report suggests more than 7.5 billion voice assistants will be in use by 2022. This probably includes the 1.3 billion current users of Google Assistant. This means that there is no new app to download. Just attach a certified Voice menu Action powered by Orderscape and bam! Pete Craig, who heads our London office for UK and Europe markets, and I attended the CGA Restuarant Analytics event in London, April 19th. I was able to share some ideas on how voice works in the restaurant environment and introduce the audience to our newest product; VoiceKPI. VoiceKPI is a way to voice-enable a data and insights dashboard without needing a screen. Just plug into a back office system for analytics and select your favorite KPI’s and just ask your business how you’re doing! Very cool. See more information about VoiceKPI here.